It is comforting to do your banking with a large bank that is well known and well established. 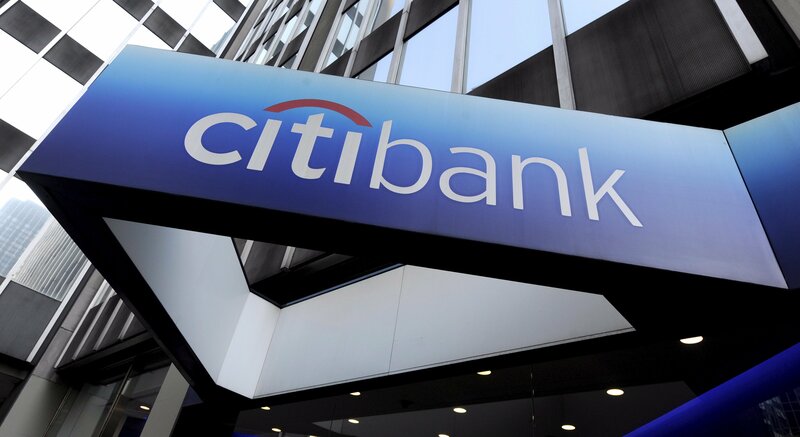 Citibank has a strong history and offers banking services nationwide. However, the trouble with big banks is that they often are only in large cities. If you don't live near a branch, you may think you are out of luck. Even if you don't live near a physical branch, you can still do business with this bank. With a Citibank online banking login, you can bank anytime, anywhere. This is only one of the great services that this national bank offers. Find out more about Citibank, its services and products, along with how it compares to a couple other big banks as far as service and products are concerned. Citibank currently operates as part of Citigroup. The bank was actually founded in 1812, and it has had a pretty lively history. Samuel Osgood was the first president of the bank after it was started. Throughout its history, the bank has gone through many name changes. It began as the City Bank of New York. The name later changed to the First National City Bank of New York. As it expanded and grew, it eventually became Citibank. Today, the bank has a total of 2,649 branches. It operates around the world in 19 countries. The global aspect of this bank does not mean it isn't committed to the customer experience or that it has lost its roots. In fact, its large size forces it to be more responsible and more focused on ensuring customers are handled well. In addition, the bank is able to offer more services and more options to its customers to ensure the best possible outcomes. The bank's main goal is ensuring customers feel secure and trust in it to help them with their financial needs while also being a source for customers to improve their quality of life. Citibank is dedicated to the communities it serves. It provides access to funding to businesses so they can grow and provide jobs. Above all, the company is focused on being a responsible institution that its customers can completely trust. This is done through careful management and quick actions. Understanding Citibank can be easier when you understand its history. There are many things that have happened since it opened in 1812. Here is a look at some of the highlights. 1831: Victim of a bank heist where tens of thousands of dollars and 398 gold doubloons were stolen. Citibank offers a nice array of products and services to customers. These include those for personal and business customers. It offers everything from savings accounts to wealth management services. Here's a look at some of them. The Citigold Package helps customers with banking and wealth management through a top-tier checking account. As part of the package, you get a financial advisor to help you with your investment decisions. In addition, you have access to Citi Clarity One-on-One. This package also includes preferred pricing and rates for other products and services, along with a waiver of the monthly service fee. There is a minimum average monthly balance required. The Citi Priority Package is another checking account option. You do get access to a financial advisor by phone along with resources to help you with investments. You also get preferred rates on some other accounts and services. There is a minimum monthly average balance requirement. The Citibank Account Package is a checking account that gives you the opportunity to earn higher rates for money market and savings accounts along with no fees for using outside ATMs. Some rewards are only available if you meet minimum average balance terms. The Basic Banking Package is a low fuss checking account that comes with unlimited check writing. You can get the monthly service fee waived if you keep a minimum average monthly balance. You may also qualify for special options if you are 62 or older. The Access Account Package is another simple checking account. This option does not include paper checks. It does not have overdraft fees, and the monthly service fee can be waived if a minimum monthly balance is kept. In addition to all the checking account options, there is Citi Savings. This savings account can vary as far as perks and benefits depending on other linked accounts. It also provides the ability to write checks from the account. Citibank offers Certificates of Deposit with guaranteed interest rates. There are also options for maturity dates, terms and laddering. This account can also be linked to other accounts you hold with the bank. Banking IRAs are another product option. The bank offers traditional or Roth IRAs along with no annual fee. You can invest in CDs or money market accounts. The bank provides investment options, including the following. When you invest with the bank, you get to plan out your investments with the assistance of a financial advisor. You also get access to a successful investment platform. You can take advantage of Citigold wealth management system. This offers you a Citigold relationship manager who acts as your point of contact for all your Citibank accounts. You get personalized financial planning assistance from your Citi personal wealth management financial advisor as well. As a client, you can gain access to the Citigold Concierge, which is a personal service available to help you 24/7 with your needs. Citibank works with businesses, offering a range of services and products to help any size business to handle its financial management. These include the following. The bank has commercial bankers to help large businesses with everything from expansion to daily management. Because Citibank is a worldwide company, getting rate and fee information is done based on geography. Due to the currency differences and even differences among regions, it would be impossible to provide a list of rates and fees that would be adequate for everyone. So, we are choosing not to give any pricing information to reduce confusion and ensure that you only get the most accurate information available. If you want to find out what rates and fees would be for you, then you can visit Citibank's website where you will enter your location to get a list of the different costs for services and products. When you are shopping for any service, even banking, you need to comparison shop. This helps you see how the bank you have chosen stacks up to the competitors. You will learn if your bank is lacking in any way or find out that it is much better than other options. We have done the legwork for you by comparing Citibank with two other worldwide banks that offer similar services and products. 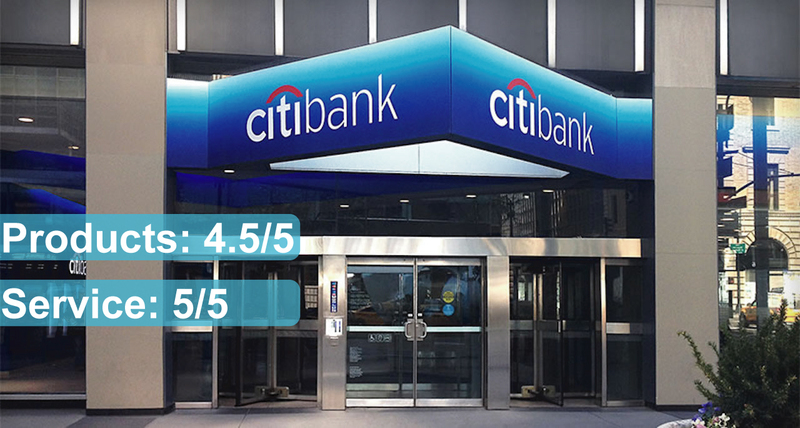 You can see how Citibank compares to get a better idea of what to expect from this bank and your banking experience. Citibank does offer a lot of products and services, which is nice for customers looking for multiple ways to manage their finances. The bank does a great job at online banking. The online platform is well put together, user-friendly and very adaptable to mobile devices. Finally, customer service options are plentiful, allowing customers to contact the bank using various methods any day and any time they need assistance. Where the bank seems to lack, though, is in the basic areas of rates and fees. The savings account rates are so low that it isn't hard to find something better elsewhere. Plus, accounts come with monthly service fees that are hard to avoid without keeping large balances. 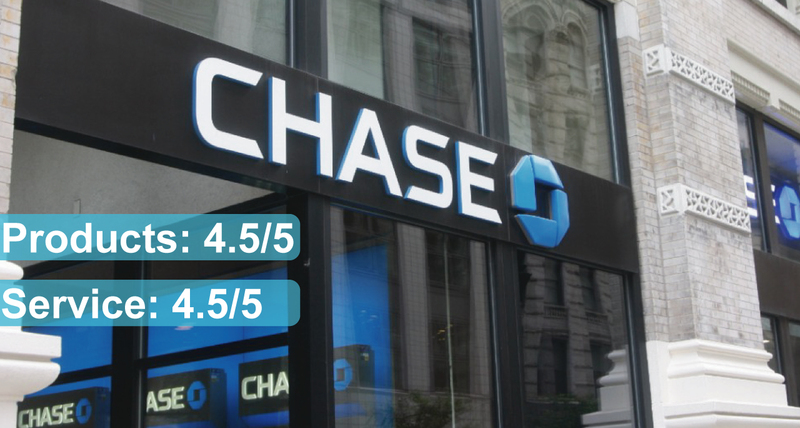 Chase gives Citibank a real run for its money because it is more widely accessible throughout the country than Citibank, but it is still limited to only certain regions. This bank also makes avoiding fees easier, but if you have to pay fees, they will be very high. Again, as with Citibank, the savings rates are low. Chase does offer some nice bonus earning options on certain accounts. As far as customer service, the bulk of it happens on Twitter, but there is also a great phone system in place to make it easier to get help that way if needed. Customer service is available 24/7. The online banking platform is well designed, but online deposits may take longer to reach an account. Bank of America is another big bank in the United States. It does well when it comes to account fees and making them easy to avoid. This bank has a lot of ATMs and branches throughout the country, so it does much better in that aspect than Citibank and Chase. The online system is fairly good, and the bank has a very strong mobile app. 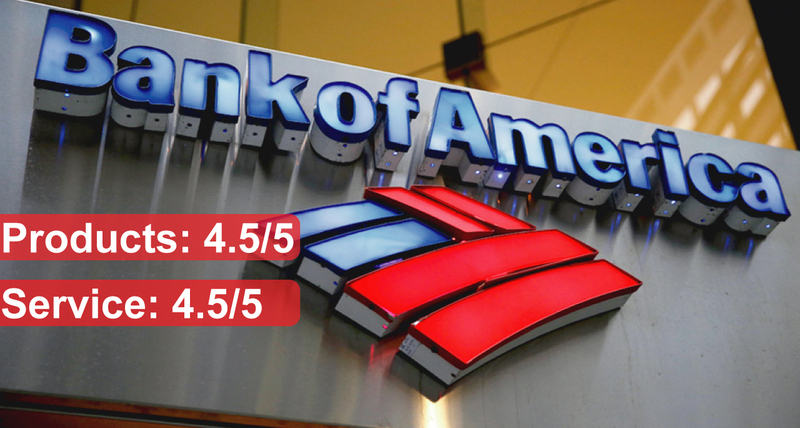 On the downside, Bank of America isn't shy with overdraft fees. You could be hit up to four times each day with this fee, which can add up fast, but the bank does offer a protection plan to allow you to avoid these fees. As with the other banks, the savings account rates aren't that great. Customer service phone hours are open late for contact with a real person. The bank also communicates via Twitter with customers. There really is no better way to learn about a company than to read reviews from people who already do business with it. That is why we always recommend looking through reviews. However, we know this is a time-consuming process and that your time is valuable. Because of this, we went ahead and read the reviews for you. We sifted through countless reviews written by real customers to see what they were saying. We weeded out bias and got to the heart of things to bring you the most accurate pros and cons list possible. Offers many customer service options, including 24/7 support. Provides a lot of information and tools for financial management. Lots of ATMs for easy access. Allows linking of non-Citibank accounts. Monthly fee waiver account balances are high. Rates of basic savings accounts are low. More branches overseas than in the United States. There are always some tradeoffs when doing business with a large bank, and Citibank is no exception. A larger bank tends to offer you more products and services. It can afford to take bigger risks and may offer you options that smaller banks cannot. It usually has much better customer service options. You can talk to someone at any time of the day and get help whenever you need it, even outside of banking hours. Citibank offers all these things, but they come with a catch. With a bigger bank, you also get bigger fees. Sometimes you can avoid fees, but this seems to be one of the issues with Citibank. The bank doesn't make it easy to avoid fees on any of its accounts. In addition, savings account interest rates are often low. You can probably find better rates for savings products with smaller banks. With all that in mind, we docked the bank half a star. We know some people will be willing to accept the downsides of the bank because the good points can be really nice.